So as you probably guessed, I bought a header for the Yaris: The DC Sports 4-1 header to be exact. The installation was pretty straightforward—certainly one of the easier header installations I've performed, despite the location on the back side of the engine. 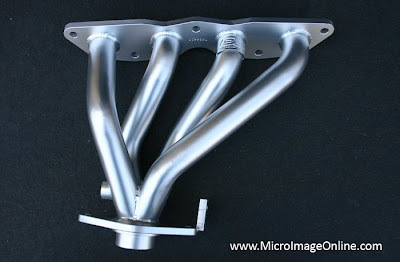 The DC Sports header is a very nice piece with outstanding build quality. The only snag I ran into was that the support (the tab at the lower right hand corner) didn't 100% line up with the Toyota support bracket. Solution? Dremel tool to the Toyota bracket, of course (removed about 1/8"). Performance results are noticeable, too. The car seems to rev more freely after 4,000 RPM. I'd expect a couple of horsepower out of this mod. Naturally, I bought my header via Micro Image. A recommended product to all those that have a 1NZ-FE under the hood (aka Yaris, xB, xA, Echo).